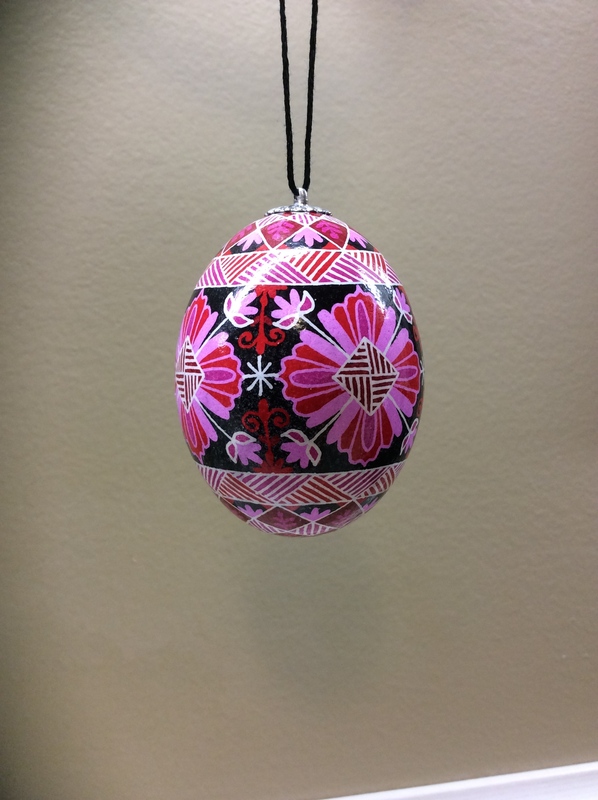 This is an example of what is commonly known here as Ukrainian style egg art, although it’s practiced in lots of countries in eastern Europe besides Ukraine. In Slovakia, where my husband is from, these decorated eggs are known as “kraslice”. The eggs are blown, prepared, and then dyed with several layers of color using a beeswax-resist process very similar to batik on fabric. Then the dye is removed to reveal the jewel like colors underneath… the reveal is the best part of the entire process, because you never know exactly what you’re going to get, despite even the best efforts to anticipate the design layers and the combination of dye colors on top of each other. You can check out more of my egg art at http://www.etsy.com/shop/rajilina, or on my Facebook page at http://www.facebook.com/rajilina. I do sell these, but, just go there to see the fun colors and designs! These are the beginnings of a trim for the new dress. These are black taffeta points and will be layered over another piece of trim. Kind of tedious to make, but it’s a good chance to catch up on Netflix shows while I crank them out. With today, I’m starting a new dress project. I was lucky enough to get some gorgeous gold and black flocked taffeta at a “half off clearance sale” – you have to love those kind of sales – and it is an entire bolt, so I’ll have enough to do some experimentation; maybe enough to make two or three different styles using the same fabric. I usually get into the project better by starting with the easiest piece, so I’m constructing a simple underskirt out of black taffeta. 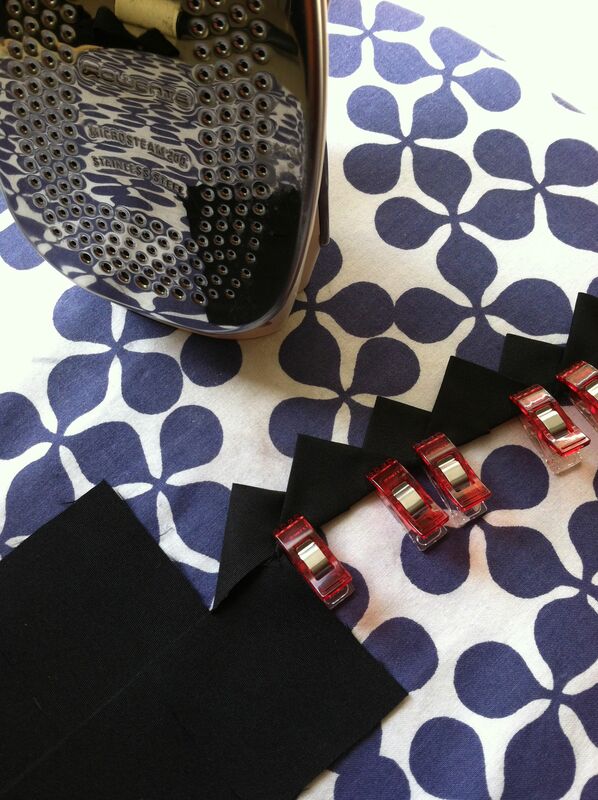 The skirt is simple, but the trims will be very complicated and should really make it look very luxurious. The problem with all of this is that I took my new Brother in to the service department for a look at the automatic needle threader which hasn’t been threading properly for a little while, and to keep working, I’ve had to go back to my very, very old New Home in the meantime. Boy – have I gotten used to the Brother! I keep reaching up to push the automatic thread cutter and it isn’t there! And although the old machine worked very well for me for a very long time, I realize now how clunky it sounded compared to my new machine. I also miss the stitches! All those 400+ stitches I had to choose from and now I have just a few. My Brother should be back from service in a week or two but it’s going to be a long week without her! It seems like an eon since I’ve been here. A crazy summer with more work than a sane person should have to handle got in the way of a lot of things I wanted to do, then losing my job in late September further complicated things. It’s been an adjustment, as anyone in this situation surely understands… but, I have a roof over my head, food on my table and the things that matter most in life have really been my rock in the last few weeks, so I can’t complain. I’m going to be OK. If anything, the door has been opened to a lot of possibilities that I hadn’t considered even a month ago. It started with my entry into the 2012 Utah State Fair… an 1870s Victorian Natural Form gown, which to my utter shock ended up winning the Grand Prize Best of Show in the Home Arts department. That sure gave me a big shot of confidence for being able to market my sewing and craft items on my Etsy storefront. I have also started some of the most creative work I’ve been able to do in the last 14 years… with something as simple as my resumé and mini-portfolio. The only one approving this is me, which is quite a change. I’ve got so much on my plate now, but the main difference is that it’s no longer stressful. 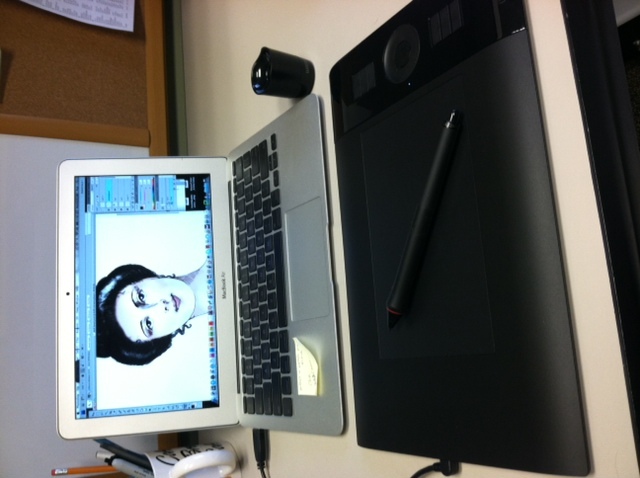 It’s finally starting to be….. fun! A few weeks ago I ran across some information for a very interesting sewing project called the The 1912 Project: Sewing the La Mode. This website is dedicated to test sewing and producing for public use a series of period clothing patterns taken from the 1912 issues of La Mode Illustrée, which was one of the premier fashion magazines of its era. 1912 was particularly chosen by the project founders to commemorate the 100 year anniversary of the sinking of the Titanic on April 15, 1912. These are the same the folks who run the Vintage Pattern Lending Library, a wonderful repository of vintage patterns available for checkout to the public for a modest fee; if you love to sew and love vintage/historical, and have never been to the VPLL, I highly suggest a visit. In any case, I felt some new enthusiasm for taking on another costuming project after reading about the group, so I contacted these folks to become involved. Well, things went from here to there, and now suddenly I discover myself to not only be sewing test patterns, but also to be one of a small group of Blog Editors for the site. One of my first tasks has been to create a set of paper dolls and blog badges based on the patterns being tested by site participants. I plan to start with the picture below, which is one of the test patterns currently available to project participants, as a base for the drawing of the female doll. I think she already has a PERFECT paper doll pose and not only that, she is a very sweet and attractive representation of the period. 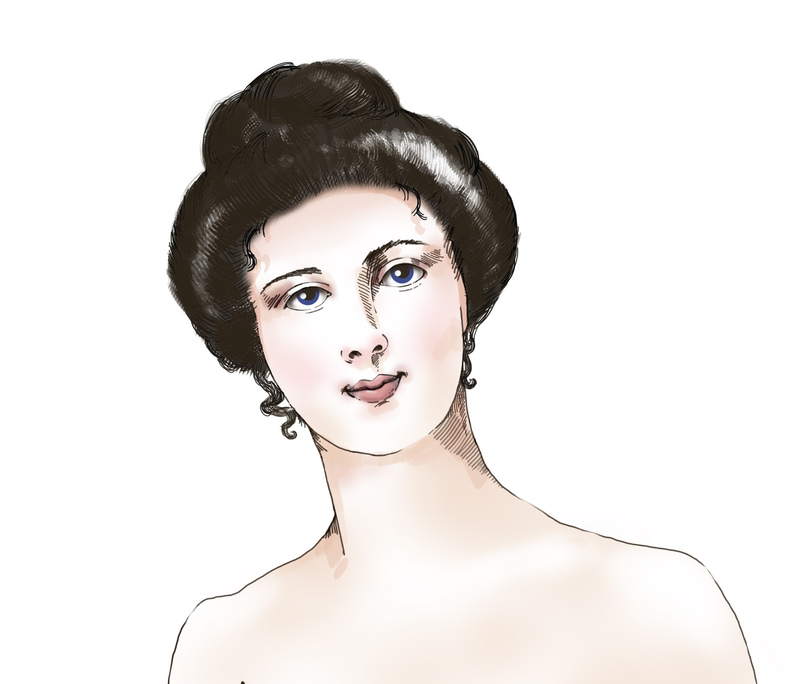 As I progress with the doll artwork, I will post updates to this blog. I had a bit different idea in mind when I started this dress, and after seeing the first few rounds of ruffles on the train, I decided to keep to the ruffle theme and so, box pleats which were going to be on the front turned into a tall ruffle instead. 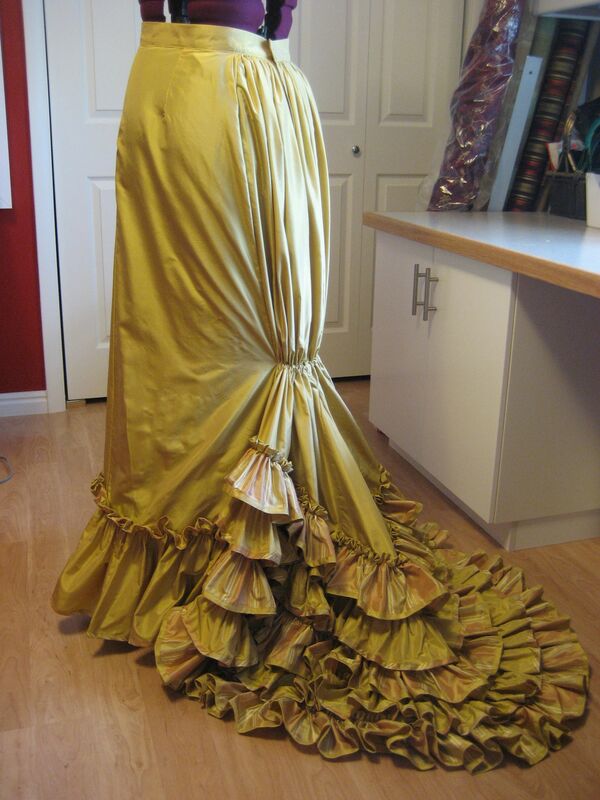 All of the ruffles are edged with handmade bias tape in a contrasting fabric to the main ruffle color. The colors are subtle and hard to see in the photograph although much more vibrant in person – for the pattern I have a striped silk taffeta in colors of peach, taupe, cream and golden yellow, while for the solid I have a silk taffeta in a plain golden yellow. This is a very different color choice for me as I usually tend to like darker, richer jewel colors, but it has been fun to work with. And I am loving silk taffeta…. this taffeta is SO crispy and nice and keeps whatever shape I make out of it. So far I have just the underskirt finished. I am about 3/4 of the way done with a pannier overskirt using a Truly Victorian pattern, which I intend to drape differently via the use of ties than is indicated in the original pattern. I am as yet undecided about which bodice style to use. Is it a ball gown with a low neckline and short sleeves? A promenade dress? A dinner gown? …. Now that my studio is finished, I can get back to making things! This is a new creation I’m working on for my Etsy store. 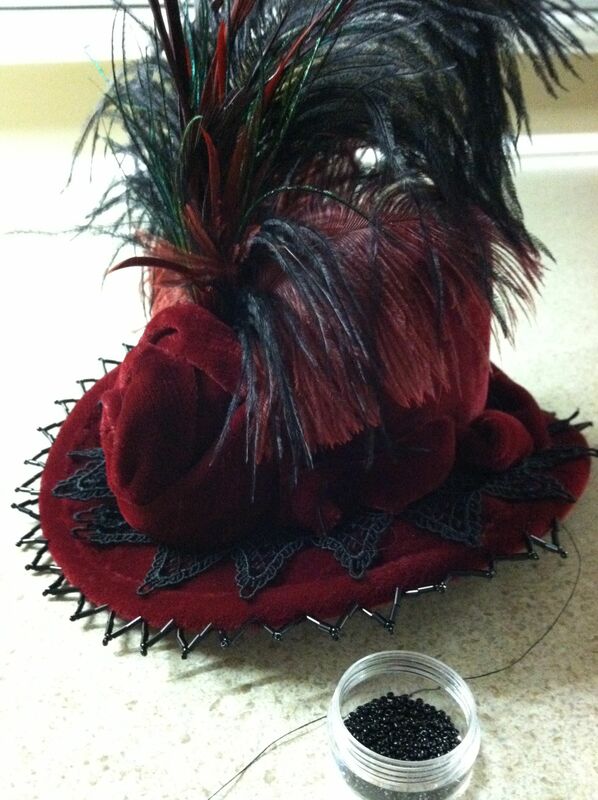 It is a Victorian style, high crowned hat in maroon velvet with Venice lace trims and different textures of feathers. I wanted to do something to add a little bit of subtle sparkle to it, but still keep it in a Victorian feel so I settled on these cut glass, jet black beads. I tried a couple of different ways of attaching them before I settled on the style shown below. I love this fringe because the points echo the triangular points pattern of the Venice lace that I’ve already attached below the hatband trim. I think I might also try to figure out something beaded for the back, or around the top of the crown. This would be a great hat for a Dickens Festival costume because of the rich red colors and thick wintery feel of the velvet fabric. 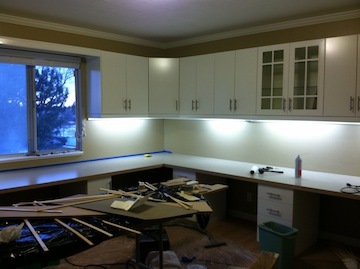 I’ve been offline for quite a while but there’s been a good reason for it… a home remodel of my sewing room, that turned out to be more work than either my husband or I had anticipated (well, aren’t they always more work than we think they will be?) I really truly had the best of intentions with this blog when I started it, but I’ve been documenting the house project rather loosely on my Facebook page instead of here because it just seems to be quicker to take the picture with the iPhone and do a fast upload and comment, when I am already there keeping up with my friend’s comings and goings. I don’t have a fancy digital camera so the pictures are crude in lighting and composition, but I’m glad I documented it anyway because the transformation of the sewing room was quite surprising to me at the end when I went back to those initial photos. You can read more about the room here.